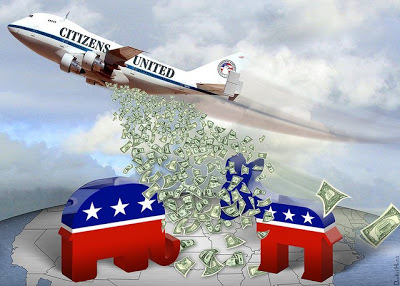 “Citizens United Carpet Bombing Democracy.” Cartoon by DonkeyHotey / Flickr Commons. David Hamilton argues that the U.S. federal elections in 2012 don’t merit being the focus of our attention, while Jay Jurie contends that they still offer worthwhile opportunities for progressives and that the electoral arena should not be abandoned to the Right. The following exchange between David Hamilton and Jay Jurie began on The Rag Blog‘s email discussion group, a lively forum in which Rag Blog contributors and followers debate issues of the day with, shall we say, great vigor! Being a presidential election year, the left in the U.S. is locked into its recurring debate on how to relate to the federal elections. There are always those who decide that the Democratic Party candidate is good enough or the Republican candidate is bad enough that it is essential to support the former — with one’s vote, if not with one’s enthusiasm. Then there are always those who declare that the Democratic Party candidate is essentially subservient to the same corporate interests as the Republican and that we shouldn’t be associated with either. When this position involves a third party candidate such as Ralph Nader, the discussion can become bitter. Here David Hamilton argues that the U.S. federal elections in 2012 don’t merit being the focus of our attention, while Jay Jurie contends that they still offer worthwhile opportunities for progressives and that the electoral arena should not be abandoned to the Right. The corruption of U.S. electoral politics. U.S. federal elections are corrupted by capitalist class money to the point that further participation by the Left primarily lends credence to a charade hiding the continuing evisceration of American democracy. In 93% of races for the House of Representatives and 94% of races for the Senate, the candidate with the most money wins. In 98% of the races where the incumbent has the most money, the incumbent wins. The obvious strategy for a candidate is to have the most money; to have your own and/or cater to moneyed interests. For the moneyed interests, the obvious strategy is the way Reagan defeated the Soviet Union in the arms race, by making continued participation financially crippling if not impossible. Presidential election spending is increasing geometrically. 1992 – $ 192.2 million. 1996 – $ 239.9 million, up 25%. 2000 – $ 343.1 million, up 43%. 2012 – Estimates of total expenditures by all candidates in federal elections go over $5 billion. A conservative estimate is for a 100% increase in expenditures of all candidates in the presidential race over 2008, reaching a total of roughly 13 times more than 20 years ago. It is logical to expect this process of expenditure growth to accelerate markedly in the wake of the “Citizens United” decision. In 2008, small contributions ($200 or less) provided 9% of the funding for House Democrats and 14% for House Republicans. Those percentages are historically declining. The rest comes from the 1% in the form of large contributions, PAC money and self-financing. Gov. Scott Walker of Wisconsin won his recall election 53 to 47 while spending a record amount of money (over $50 million), outspending his opponent over 7 to 1 and receiving over two-thirds of his money from big out-of-state capitalist donors, specifically the Koch brothers. In a capitalist hegemony such as in the U.S., all things of social value become commodified, especially political power. The strategy of the capitalist class, that richest less than 1% who own and control the major corporations, is to own the federal government by commodifying elections, largely because the federal government funnels hundreds of billions to them annually and protects their economic privileges. A crucial part of their strategy is to increase the price of elections as much as possible so that elections must be bought at a price only they can afford. As their money increasingly dominates elections, democracy increasingly diminishes, the principle political objective of the capitalist class. For the Left to participate in this electoral charade is to give it credibility it does not disserve. Whatever benefits might once have derived from participation now pale compared to the legitimacy the Left stands to gain by leading the denunciation of the system’s inherent corruption. There is no inside-outside strategy, because you don’t have that very expensive entrance ticket and the event is sold out. Electoral politics: A path to the future or a road to ruin? That money shapes elections is undeniable. National, state, and even most local elections cannot be won without enormous cash infusions. As of April 30, the Obama campaign had raised nearly $217 million while the Romney campaign had raised more than $98 million. In the Ohio senatorial race, incumbent Democrat Sherrod Brown had raised over $12 million by March 31, while Republican Josh Mandel had raised over $7 million. Graphically depicting the funding disparities, Independent Scott Rupert had raised some $2,000 (Source: opensecrets.org). Some contend that grossly disproportionate amounts of spending have made participation by progressives in the electoral process meaningless. However, there are other aspects that must be considered. One would be not just the amounts of money, but its sources. Although for-profits and wealthy donors have deeper pockets, funding from not-for-profit sources and small contributors may be significant, as shown in the Sanders example. Also illustrated by the Sanders example is the particular candidate or party involved. Sanders has carefully constructed a base, and has such name recognition, that he may be very difficult to unseat in Vermont. In cases such as these, stepping away from the electoral arena would be self-defeating, it would only abandon turf that has already been won. An aspect of vital importance is the campaign message, and how effectively it’s packaged and delivered. Particularly in swing elections, or districts, a well-crafted campaign message is an essential complement to campaign finance. Without a message that captures the mindset of the voters, or when running a scandal-ridden candidate, a monetary advantage may not suffice. Depending on circumstances, timing may outweigh money. Since there is effectively a two-party system in the U.S., the only way people have to “punish” those in power is by voting “for the other guy.” Due to their displeasure with the George W. Bush regime by 2008, the Republicans took a beating. Two years later, the Democrats under President Obama took a “shellacking,” as he expressed it. Most would likely agree that saturation of the media with campaign ads is the primary concern raised by the Citizens United decision. Those without the funding to outspend their opposition with ads usually understand they must rely instead on a ground game; going door to door, driving voters to the polls, and so on. A good ground game can sometimes beat a well-financed corporate campaign. In 2004, the Florida branch of the now-defunct ACORN organization caught corporate interests off balance and got a minimum wage added to the state constitution. Although the leadership of the Democratic Party functions as the junior partner of big business, there is no doubt that the Republicans are the senior partner. Historically, both parties have viewed it as important that some differences be maintained so as to preserve overall system legitimacy. So long as this Janus-style duality exists, the doors to moderation and a certain level of change have not been slammed shut. For instance, it would be better for Sherrod Brown to remain in the Senate than for him to be beaten by Josh Mandel. If the playing field is abandoned to the far right, then so are appointments to the courts. Participation in electoral politics guarantees neither a rosy path to the future nor a road to ruin, but it remains part of a long journey that has to be taken. There is no question but that campaign finance reform must be at the top of the list on any meaningful electoral reform agenda. Though it will take considerable pressure from outside the system, ultimately, this sort of change cannot be brought about without recourse to the electoral system. For those who want to participate in such an effort, go here to get involved with overturning Citizens United. “[I]n political science terms, if you are outspent… the way that Republicans can outspend Democrats with unlimited corporate money, the Democrats are going to lose.” — Rachel Maddow on MSNBC. “The system is totally gamed.” — Chris Hedges on Truthdig. “I most certainly do believe the patient is critically ill, but… I haven’t given up hope entirely.” — Jay Jurie on Facebook. Though admitting that the system is “critically ill,” Jay Jurie’s apologia for the existing electoral system would have us continue putting our energies into life-support mechanisms. He fails to mention that the patient is terminal. There remain instances where participation in electoral politics continues to make sense, but the point is that with the onrushing tide of corporate money in politics, these instances are rapidly diminishing and those that remain are almost always restricted to supporting the less horrible of the two options presented to you by the 1%. The idea that the financial support from non-profits can meaningfully mitigate the advantages of the for-profits ignores the existing wide disparity of financing and the actual record of overwhelming success enjoyed by better-financed corporate candidates. The point is that when campaigns become more costly, as is happening now at a very rapid pace, the advantages of the wealthy increase. Jurie fails to acknowledge this dynamic or its implications for the future. Sometimes electoral opportunities do arise on a local level that call for our commitment, but these are increasingly rare and don’t happen outside isolated constituencies. Bernie Sanders is a perfect example of such an aberration. He represents Vermont, which has the second smallest population of any state. 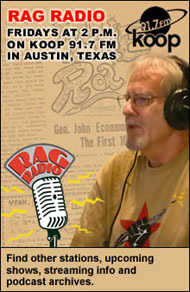 There are more registered voters in the city of Austin than there are in Vermont. Sanders ran statewide four times during the 1970’s without ever getting more than 6% of the vote. Finally, in 1981, Sanders won a mayoral race in Burlington, a college town with less than 40,000, by a 10-vote margin with four candidates running and the Democrats divided. Being the great guy he is, he won three more terms as mayor, but was defeated twice more before winning his first statewide office (on his seventh attempt) with his election to Congress in 1992. He has consistently been reelected ever since and is now a U.S. Senator. That.experience was unique in time and place, little liberal Vermont in the late 20th century. I cannot conceive of a similar scenario occurring in any other state henceforth. The capitalist hegemony is growing quickly. What Bernie Sanders once accomplished in Vermont, however laudable, is not a model that is very relevant today. Leftist cadre should have more fundamental concerns than the devotion of their attention and political energy to helping elect Democrats. It is more important to focus on the rapid diminution of democracy that is concurrent with the rising power of corporate capitalist money, now dominating the electoral arena. The death of meaningful democracy given this power inequality is the principal issue of politics in the U.S. today. Jurie’s argument essentially boils down to another rationalization for supporting Democrats, relying on their strongest argument, that the other guy is worse. This might be acceptable if you limit your political ambitions to marginal gains one might potentially achieve within the confines of identity politics. Were gay rights my overriding goal, I would be more supportive of Obama. If your political horizons stop at verbiage in support of marriage equality, the right to fight in the imperial army, or the preservation of the Roe decision, you might be happy with the Democrats. But Obama is living proof that identity politics are innately reformist and do not significantly impact issues involving class relationships. Capitalist hegemony can accommodate the civil rights of non-whites, women’s equality, and gay rights. It can live with legal pot and abortions. But it will not accept reforms that effect their class privileges, existing wealth and income inequality. Progressive taxation, taxing capital earnings the same as wages, estate taxes, wealth taxes, financial transaction taxes, uncapped social security taxes, widespread worker ownership, promotion of union membership, or the provision of good social services to the entire population are forbidden. The capitalist class abhors democracy, a public sector devoted to social well-being for all, and the protection of the environment, all of which diminish their power and bottom line. It cannot tolerate the diminution of U.S. militarism or the end of a drug war, because it profits by tens of billions annually from each. Our electoral system is now incapable of impinging upon these core economic interests of the capitalist ruling class or their ownership of the political processes. In response to this condition, Jurie recommends support for a constitutional amendment to reverse the Citizens United decision. This effort is doomed because it ignores of the fact that such an amendment would require the vote of two-thirds of each house of the Congress, plus majority passage by three-fourths of the state legislatures, all already densely populated by politicians on the payroll of the capitalist class and likely to soon become more so. One might reasonably ask why a very large majority of these legislators, being corrupted fronts for the capitalist class, would vote against the class interests of their benefactors and themselves on a matter so grave as a constitutional amendment to reduce their power. The Left, at least those to the left of the Democratic Party, has the opportunity to champion democracy. There is already widespread awareness of the rampant economic inequality and the rapid erosion of political democracy that has resulted from the growing influence of corporate money. It was reflected in the instant popularity of the OWS themes. It is reflected in the lowest voter participation in the developed world. Anti-bankster consciousness is even common among Tea Party adherents and Ron Paul fans. It remains a consciousness without organized leadership. The Left can fill that breech. But besides advocacy of both economic and political democracy, this leadership challenge requires a thorough critique of the advanced state of corruption of U.S. politics, maintenance of a steady focus on the overall system’s inherent undemocratic defects and rejection on principle of participation in all but the least corrupted electoral venues. Jurie’s argument is trapped in the “duopoly” of conventional American two-party politics. Those who want fundamental change must escape that duopoly. Leftist leadership has more important things to do than support marginally better candidates trying to pass themselves off as reformers while hiding their corporate affiliations. The electoral system engenders adherence to its norms, rewarding candidates who accommodate. It will increasingly operate in the interests of the capitalist class as the commodification of the electoral process continues unrestrained. To play in this rigged game is like being an old slot machine junkie living in a Vegas casino. There is scant opportunity for an inside-outside strategy when there is no room available inside except at a price you cannot imagine. “A revolutionary dialectic of the correct transitions must regard the ‘long march through the institutions’ as a practical and critical action in all social spheres. It must set as its goal the subversive-critical deepening of the contradictions, a process that has been made possible in all the institutions that participate in the organization of day-to-day life.” — Rudy Dutschke, German New Left leader, 1968. In seeking a straw man for debate, David Hamilton has mischaracterized my position on electoral politics. For instance, my initial statement made it abundantly clear that I am acutely aware of the corrupting influence of money in politics, especially in the wake of the Citizens United decision. My primary emphasis is on the construction of a vibrant grassroots movement that can challenge not only corporate power in the electoral arena, but replace capitalism itself with a system that, on a far more inclusive and democratic basis, serves the needs and aspirations of society as whole. This would necessarily involve both electoral and non-electoral means. Not only would Hamilton abandon the electoral field of battle to corporate interests, so also would he leave millions in the lurch. Hundreds of thousands have fought for, and some have died, to secure the right to vote in this country over the past two and a half centuries. Most often the deck was stacked against them, but they put their shoulders to the wheel, built movements and slowly rolled society forward. Electoral politics and social movements have had a reflexive relationship. 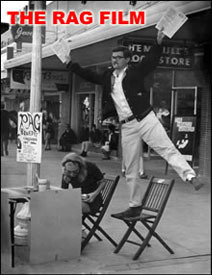 Movements have made gaining wider public access to the ballot box possible, and use of the ballot has brought about important social changes. By way of example, the Civil Rights movement began after World War II and some 20 years later, resulted in the passage of the Civil Rights Act of 1964 and the Voting Rights Act of 1965. Since that time, African-Americans have not only experienced far greater access to accommodations and elected thousands of their own representatives to office, but have experienced access to numerous other opportunities, ranging from education to employment to fair housing. To proclaim “game over” as Hamilton has done, denies all this history and those who not only fought for these gains, but for better or worse, those who still believe participation in the electoral process has some potential. To tell progressive constituencies such as labor, minorities, women, gays, or seniors that such participation is meaningless smacks of white upper middle class privilege, and will surely be regarded that way. If the process doesn’t work, if it’s overwhelmed with money, and dominated by a duopoly, which it is, then as Rudi Dutschke informed us, all the more reason to be involved. There are a multitude of ways the present system can be confronted, challenging it to greater openness, responsiveness, and representation. Again, the weight of history is behind this type of approach, and turning away from it does nothing to challenge the inherent contradictions. Exploiting these contradictions would eventually open the door to class conflict, or if not, at least help spark a legitimacy crisis. Worse yet, while repudiating electoral participation, Hamilton provides nowhere else to turn. While he vaguely argues we should “champion democracy,” he doesn’t specify what that means. If change cannot be brought about through voting, then what else does Hamilton propose? He essentially urges a boycott of the polls in return for nothing to show for such an effort. This is a “bargain” very few will likely accept. This reply is dedicated to the memory of Harry T. and Harriette V. Moore, who in 1951 gave their lives, in part, in the struggle to secure suffrage for everyone. This entry was posted in Rag Bloggers and tagged Campaign Finance, Citizens United, David P. Hamilton, DonkeyHotey, Electoral politics, Jay D. Jurie, Progressives, Social Change, The Left. Bookmark the permalink. This is a very interesting debate. Both sides make lucid points. If it is indeed “game over” it is only because at our age we might not be around for Game 2. I sincerely hope people will vote in their own self interest not being swayed by the appearance of money-might makes right. Recall “Eugene Locke will be governor of Texas” not. I hope this election will squash the idea that democracy is indeed for sale and can be bought. The cartoon is spot on. I’m sharing it. Thanks. David Hamilton makes excellent points. I will add, however, that the patient is beyond “terminal”. In fact, it was killed as an infant, since developing a system that was truly reflective of democratic values was never the American goal. That much of the Left, or what passes for one in this country, is once again stuck in supporting the usual election charade is sad proof that the saying “the more things change, the more they stay the same”, still holds true. Every field and arena is corrupted and commodified. Capitalism is terminal as well–but we still go to demonstrations, put our paychecks in the bank and use our debit cards at the supermarket. The insurrectionary moment and its tactics are not yet here. Casting a ballot is the least important thing about elections. I actually don’t like electoral politics, but I do it anyway. Why? Because you can organize more widely. In an election campaign, you can multiply your outreach by a factor of ten or more. I don’t ever expect to get a majority in Congress, for all the reasons Hamilton lays out. But I do hope to have an organization powerful enough to create a new Congress in a new order when this one implodes. We get to socialism not by elections, but we must proceed THROUGH them, until the progressive majority sees them as exhausted and the situation becomes insurrectionary. The same is true for every other area–trade unions, civil rights, school reform, poverty relief and so on. It’s not how many votes you can get, important as that is. It’s how tough, rooted, disciplined, and combat-ready of an organization you can build, no matter what the arena. If you don’t like elections, fine. there’s plenty of other places to work. But some of us will take them on anyway, simply because we can grow faster and get more battle-hardened than by ignoring them. in 2008 a number of then “conservatives” decided the best way to chastise and humble the republican party elites for nominating McCain and Palin was 4 years of Barack Obama. So we sat on our hands. But an interesting thing happened on the way to the wood shed. Obama turned out to be a smarter warrior than Bush, neither party is actually interested in controlling the budget, the Department of Empire grows each day, there is no semblence of truth found anywhere in DC, Wall street continues to operate as if it was its own small planet, and the Republican elites nominated Romney in 2012. The condition of the country after four years of Obama is not markedly different than it would be had there been a president McCain. The lesson I learned is that you cant punish the Republican elites with victory by the Democratic elite’s candidate .. they are the same elites! I plan to sit this election out. My money goes to care for the homeless where it does a world of good more than in some politicians war chest. There is nothing wrong with picking a side in politics, much like we pick a side in a basketball game that we watch, just dont expect anything to change regardless of the winner. This is a useful discussion. I agree more with David’s perspective. However, neither commentator addresses the key issue. That is, what class does each party represent. Is it not clear that both represent the interests of the capitalist class to the exclusion of all other sectors of society? The Republicans represent big capital by pushing to undo the gains of the new deal and Great Society and removing remaining restraints on corporate control of society and seeking to reduce taxes on the rich. The Democrats represent big capital by serving as their party of concessions when social movements are pushing for changes with millions of people in the streets. The left and progressives have no interest in supporting pro-capitalist parties. We can raise issues and educate people by supporting candidates that are not running on the slates on the duel parties of capital. In a horse race you can win by picking the fastest horse. In politics, you can only win if the horse plows your field after it wins the race. If the horse shits on you for the next four years after winning the race that is no victory at all. If we back a horse that will plow our field we win, even if the horse does not. PLease don’t be fooled again. The idea that participation of the American left could “legitimize” any election is hubris beyond the limits of human imagination. The truism that elections are not everything does not make them nothing. True, not all elections are equal. School board is way underrated. The good guys are not always outspent and when they are, they do not always lose. I was outspent in every contested race I had, once by two to one (I lost with 47%) and once by an undetermined amount because my opponent violated the disclosure laws (I won with 76%). Steve begins by flaunting his denigration of the importance of the Left in the US. Of course elections do “something”, in fact, both bad and good at the same time and in different proportions. But their potential for accomplishment is now overshadowed by their demonstrable negative elements. True. The “good guys” (which in Steve’s lexicon mean members in good standing in the Democratic Party, warts and all), or that which we are offered by the 1% to fill that role, are not “always” outspent. Sometimes the Democratic Party “good guys” are billionaires, e.g. the Laredo banker, oilman recently offered us for governor. This does not negate the undeniable fact that over 90% of candidates with the most money win, a fact exacerbated by Citizens United. This means increasing capitalist ruling class control in a society that is already the poster child for inequality in the industrialized world. I specifically wrote about federal elections, not local elections, which still maintain ever-diminishing elements of democracy. But were you running again today, you’d probably lose to someone who outspent you 10 to 1. That was then. This is now. It is ridiculous to suggest that serving in public office makes one “not of the left”. Daniel Ellsberg? Ramsey Clark? Jim Hightower? Bernie Sanders? Barbara Jordan? Mickie Leland? Need I continue?